The minister’s attempts to block SABC journalists from covering protests at the ANC’s Eastern Cape manifesto launch have been met with outrage. The ANC’s manifesto launch at Mount Frere in the Eastern Cape on Saturday was reportedly disrupted by singing demonstrators who were allegedly frustrated by a lack of service delivery in their area. Minister of communications Ndabeni-Abrahams reportedly blocked an SABC crew from filming the protesters. While the minister issued an apology for her actions, this was not enough to stem growing outrage over the incident. It has been reported that the South African National Editors’ Forum (SANEF) has condemned the minister’s actions. The DA’s Phumzile Van Damme was also among the earliest to raised her voice over the matter, slamming the minister’s attempt at “censoring” the press. Many others have taken to social media to express outrage, with high profile journalists, political parties, politicians and writers among them. Veteran journalist and editor Ferial Haffajee, who currently holds posts at both News24 and The Daily Maverick, took the minister to task for referring to what happened as an “altercation”. Rather, said Haffajee, the move by Ndabeni-Abrahams “was an abuse of power and an act of censorship commonly used by thugs in totalitarian states and in democratatorships [sic]”, adding that there is “no space for this in a democracy”. Acclaimed novelist, poet and playwright Zakes Mda said the minister’s “censorious action does not auger well for the SABC which she oversees”. Journalist Redi Tlhabi, who currently presents Unfiltered on SABC News, slammed the minister’s apology statement for lacking detail. She also responded to Mda, speaking out against what she sees as an abuse of power, “where office bearers believe their role is to instruct, demand & enforce their authority, no matter how wrong their position”. An Twitter account affiliated with the EFF, sending out news to its supporters, shared The Sowetan’s story on Sanef condemning the minister’s actions. EFF National Communications Manager Sixo Gcilishe said Ndabeni-Abrahams “prevented journalists from capturing the moment” after ANC MP Paul Mashatile was reportedly booed offstage. Apart from Van Damme’s earlier comments on the matter, other prominent DA members including spokesperson Solly Malatsi and Johannesburg mayor Herman Mashaba added their voices to the growing condemnation. Malatsi said the minister’s actions were “unacceptable”, particularly since she oversees the running of the SABC, while Mashaba simply shared EWN’s story on Sanef’s statement condemning the incident. Other prominent South Africans have also expressed their criticism of the minister’s actions. #Sanef: The South African National Editors Forum says it will meet with Communications Minister Stella Ndabeni Abrahams to discuss her behavior at the ANC’s Eastern Cape Manifesto Launch. @MYANC manifesto launch degenerated into chaos in the Eastern Cape. The Minister of Communication Stella Ndabeni-Abrahams, @Stellarated who is also responsible for SABC intervened to prevent SABC from taking the footage of what was going on. 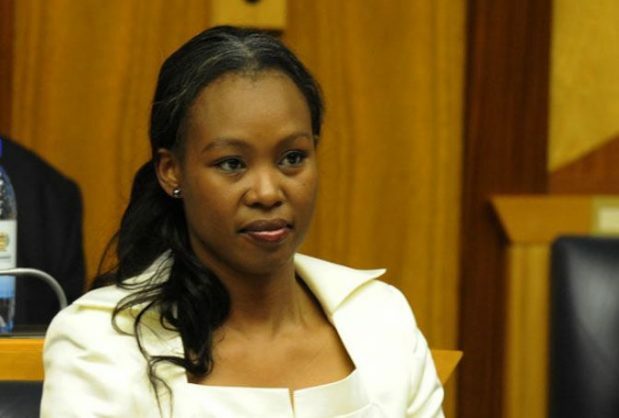 "Communications Minister Stella Ndabeni-Abrahams blocked journalists from covering the protesting crowd, telling them to stick to the event they came to cover. “Why would you give coverage to people that are out of order,” she said. Communications Minister Stella Ndabeni-Abrahams blocked #SABC video journalist from taking video of ANC members who waved placards & interrupted Treasurer General from addressing Eastern Cape manifesto launch. Stella literally put her hand on the camera. Where is #Sanef?